I really enjoyed this book. The story interchanges between the voice of Brittany and Alex (a chapter each at a time) and follows their story following a day when they are forced to be chemistry partners during the first class of their senior year. Initially they hate each other but as they story progresses they start to change their mind about one another. He is Mexican from the wrong side of town and she is white American living the perfect amercian dream for the right side of town. Everything ...moreI really enjoyed this book. 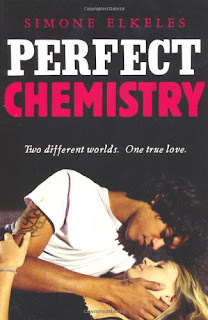 The story interchanges between the voice of Brittany and Alex (a chapter each at a time) and follows their story following a day when they are forced to be chemistry partners during the first class of their senior year. Initially they hate each other but as they story progresses they start to change their mind about one another. He is Mexican from the wrong side of town and she is white American living the perfect American dream for the right side of town. Everything is against them being together. I loved the ideas in this book about forbidden love. When you first meet the characters they appear so different and it seems that there is no way in hell they could be together yet as the story progresses and you find out more about them you start to root more and more for them to be together. I actually loved the fact that despite appearing to be complete opposites they were really quite similar in their outlooks on life. I loved that neither of them were actually like the persona they had to project to the world. I enjoyed how the story progressed and loved it when they finally got it together (very hot action going on several times there!). I really loved that the characters had a lot about them. They weren't what they seems from the outside and I enjoyed finding out about their back story. I particularly enjoyed seeing how Brittany was with her sister Shelley and finding out how tied she felt about her loyalties to her. I also enjoyed finding out more about Alex and his reasons for living the life style he did. All in all an awesome book. It was slightly predictable and a little cheesy in how it turned out but I loved it (possibly more for these things) I loved the characters and really enjoyed following them in their story. I absolutely loved this book! I love Simone Elkeles. I think her writing is superb. While the story lines and plots are common her writing style makes them unique in a way that I cannot really describe. I am very glad you enjoyed this book!